The Province of Mendoza adopted the historical flag of the Army of the Andes, preserved in the “Flag Hall” of the Government House of Mendoza, as its own provincial flag. 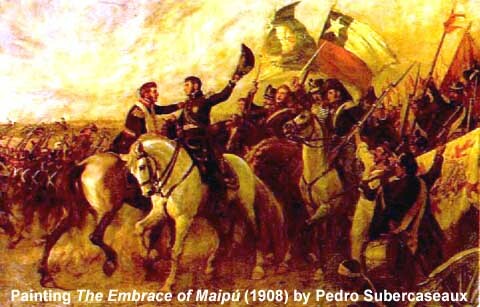 That historical flag was used in 1817 by the army commanded by General José de San Martín that crossed the Andes Mountains and Liberated Chile. Since the Army of the Andes was organized in the Cuyo Intendancy (present day Mendoza, San Juan and San Luis Provinces), the Province of Mendoza decided that this historical national flag would be the perfect one to represent Mendoza among the Argentine provinces. The idea of using the Andes Army flag design as a provincial flag for Mendoza was originally proposed by Dr. Miguel Carrillo Bascary in an article published in 1989, and later proposed by him to the provincial authorities of Mendoza. The Decree No. 5930, of 1992.10.21, adopts as the Provincial Flag the flag of the Army of the Andes. By this, the legislators are saying that the new provincial flag should be exactly as the historical flag displayed in the “Flag Hall” of the Government House in the City of Mendoza, capital of the province of the same name. The flag is exhibited as a standard or banner. Two horizontal stripes of white over blue. Higher than wide, with the National Coat of Arms at its center. The regulation does not specify how to hoist the flag. Therefore we may think that the proper way should be not on regular pole but from a "T" type pole. Nothing was legislated about the right way of hoisting the flag. The law says nothing about this subject. The correct sizes are 122 × 144 cm, from a photo of the original flag that I took in a museum. The coat of arms in the flag is the same one of the historical Andes Army flag: it is a version of the Argentine national coat of arms with a set of mountains added on the bottom. It is different from the provincial coat of arms of Mendoza. ARTICULO 1º- Reconócese como Bandera de la Provincia de Mendoza a la "Bandera del Ejército de los Andes", mandada a confeccionar por el General José de San Martín y que guiara a las huestes expedicionarias que llevaron la Libertad a las hermanas Repúblicas de Chile y del Perú y que también combatieron por la Libertad de la hermana República de Bolivia (*), como emblema de las virtudes heroicas del pueblo de la provincia y sin desmedro de la Bandera Argentina, símbolo de la nacionalidad y representación genuina de la Patria. ARTICULO 2º.-El emblema nacional no podrá ser reemplazado ni sustituido a ningún efecto. ARTICULO 3º.-El gobierno provincial mandará a confeccionar una bandera que sirva de modelo, que reproducirá fielmente en sus caracteres, colores y dimensiones actuales a la "Bandera del Ejército de los Andes". 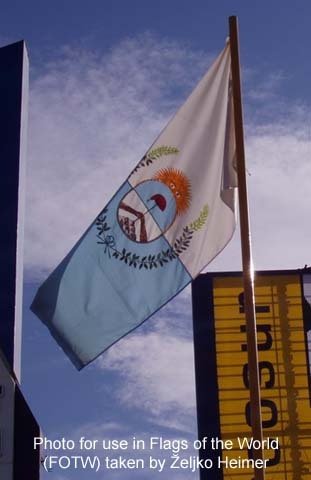 Bandera de Ceremonia de la Provincia de Mendoza, deberá confeccionarse en Gross de Seda. La bandera de flameo de la Provincia de Mendoza, deberá confeccionarse en poliéster pesado o material de alta resistencia a las inclemencias climáticas, en ambos casos deberán ser bordadas o estampadas. Laureles inferiores: derecho exterior: 22 hojas. Del laurel derecho exterior: 06 frutos. Del laurel derecho interior: 08 frutos. Ovalo que rodea el escudo: 22 lazadas. Celeste del escudo, fondo de la bandera y las cintas: Pantone 310 C.
Sol, lazo que rodea al escudo y cinta inferior del gorro: Pantone 108 C.
Gorro Frigio: Pantone 1945 C.
Manos entrelazadas: Pantone 1555 C.
Laureles superiores: Pantone 361 C.
Laureles inferiores: Pantone 575 C.
"Distinguir a los alumnos, tanto de escuelas estatales como de gestión privada por sus logros intelectuales y personales al momento de la elección de abanderados y escoltas, con la portación de la Bandera del Ejército de los Andes, acompañando así a la Bandera Nacional de Ceremonias en todos los actos y desfiles oficiales". DADA EN EL RECINTO DE SESIONES DE LA HONORABLE LEGISLATURA DE LA PROVINCIA DE MENDOZA, A LOS VEINTIUN DIAS DEL MES DE OCTUBRE DE MIL NOVECIENTOS NOVENTA Y DOS. ARTICLE No. 1.- The Flag of the Province of Mendoza will be the "Flag of the Army of the Andes", made under order of General José de San Martín that guided the expedicionary troops that delivered liberty to the sisters Republics of Chile and Perú and that also fought for the Liberty of the sister Republic of Bolivia (*), as an emblem of the heroic virtues of the people of this province without detriment to the Argentine Flag, symbol of the nationality and of the genuine representation of the Fatherland. ARTICLE No. 2.-The national flag will never be replaced or substituted under any circumstance. ARTICLE No. 3.-The provincial government will order to make a flag that will be a pattern, faithfully reproducing the characteristics, colors and present day dimensions of the "Flag of the Army of The Andes”. [Indoors] Ceremonial Flag of the Province of Mendoza, will be made of Silk Gross. The outdoor flag of the Province of Mendoza will be made of heavy polyester or weather resistance material, in both cases [the flags] will be embroidered or printed. Lower laurels leaves: Outer right: 22 leaves. Outer right laurel: 06 fruits. Inner right laurel: 08 fruits. [Yellow border of the] oval: 22 loops. The sky blue of the coat of arms, the flag and ribbons: Pantone 310 C.
Sun, ribbon rounding the arms and inner ribbon of the [Phrigian] Cap: Pantone 108 C.
Phrigian Cap: Pantone 1945 C.
Joint hands: Pantone 1555 C.
Upper laurel leaves: Pantone 361 C.
Lower laurel leaves: Pantone 575 C.
"At the moment of choosing flag bearers and colour guards, students for their intellectual and personal achievements of State's and privates school will be rewarded as flag bearers and colour guard of the [facsimile of the] Flag of the Andes Army, escorting also the ceremonial national flag in every official ceremony and parades". ARTICLE No. 5.- Executive Power to be notified. ISSUED AT THE CHAMBER OF DELIBERATIONS OF THE HONORABLE PROVINCIAL LEGISLATURE OF MENDOZE ON THE TWENTY FIRST DAY OF THE MONTH OF OCTOBER OF NINETEEN NINETY TWO. 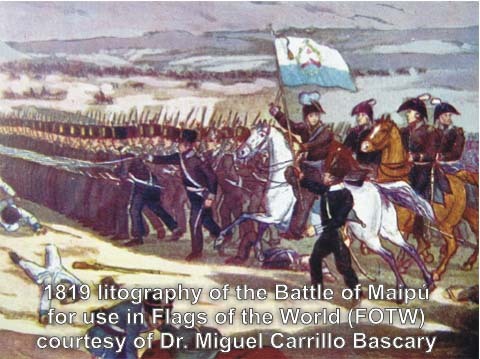 (*) Even though the text on article No.1 says that the flag guided the troops in Chile, Perú and Bolivia, the Andes Army flag just participated in the Chilean Campaign. Law translated by Francisco Gregoric and Gus Tracchia, 22 Mar 2008. The Law No. 5930 does not explain which it the right way to hoist the provincial flag of Mendoza. Since the 1960s more research has been done, and nowadays it is believed that the historical Andes Army flag was of two horizontal stripes. But in old texts and drawings in History books, the vertical variant can still be seen. This and the fact that the text of the law defines the provincial flag of Mendoza of having the "present day dimensions" of the Andes Army flag, the provincial flag would look wider than longer. So, apparently just by a de facto custom it is usually hoisted as a vertical stripes flag with a horizontal coat of arms. photo taken by Željko Heimer, August 2005. The provincial coat of arms is different from the one that appears in the provincial flag. The coat of arms of the province of Mendoza was adopted on october 25, 1941 by Law No. 1,450. Before that several variants of coat of arms were used as provincial symbols. The design is a variant of the Argentine national coat of arms. However the coat of arms of Mendoza has a cornucopia (horn of abundance) at bottom. full of fruits and flowers. It stands for the natural resources of the province. The most important activity of the province (grape plantations and wine production) is clearly represented by the grapes. Wheat and flowers also appear from the cornucopia. Cornucopias had been used in several variants of coats of arms used by Mendoza before 1941, also. The 17 rays of the raising sun represent the subdivisions of the province: 16 departments + the capital City of Mendoza.